While you were reading this sentence, several hundred muons passed straight through your body. In fact, around ten thousand pass each square metre of Earth’s surface every minute. Slightly disconcerting, isn’t it? A muon is essentially a bigger, fatter version of an electron. About 207 times bigger and fatter, in fact. Other than their size, they’re more or less exactly like electrons. Same charge, same spin. They’re both types of lepton. Unlike electrons though, they have extremely short lifespans. Muons take an average 2.2 microseconds to decay and break apart into an electron and a couple of neutrinos. Despite their short lives, muons are everywhere. They’re being constantly created by cosmic rays. Confusingly, cosmic rays aren’t actually rays. They’re high energy particles (mostly protons) emitted from all kinds of celestial events like stellar fusion and supernovae. These high energy particles slam into the Earth’s upper atmosphere with the kind of gusto that the LHC could only dream of achieving. Striking molecules in the atmosphere, these collisions create a slew of subatomic particles, including pions. These pions then rapidly decay into muons, which proceed to rain down on us constantly. With such a short lifetime, you wouldn’t think they’d travel very far. Left to their own devices, even with the speeds they attain, they’d barely be able to travel a kilometre. That’s where special relativity steps in again. Because the muons created in these collisions travel at relativistic speeds, they experience time dilation. As far as the muon is concerned, it still only lives for 2.2µs. To us, in our relatively static reference frame, they appear to live for much longer. Long enough to pass straight through anything in their way on the planet’s surface. Subsequently, they can penetrate surprisingly far into the Earth’s crust before they either decay or deflect off atoms that happen to be in their path. In fact, so numerous are the cosmic rays that generate these muons that the moon actually casts a shadow (shown to the left here) in secondary muons. This image was taken from below the ground in the Soudan 2 detector in Minnesota. A mere 120 missing muons from a total 33 million mark out the Moon’s shadow in this image. The shadow is also not an exact match to the Moon’s actual location (shown by the cross in the centre of the image. That’s because despite their speed, cosmic rays are still charged. They’re deflected slightly by Earth’s magnetic field as they approach our planet — in much the same way the magnetic fields in a cathode ray tube deflect the electrons that make the picture on old TV screens. 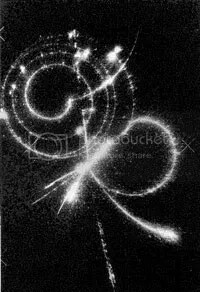 Perhaps the most fascinating thing about muons though, is that in their fleeting existence, they can actually form into atoms. Muons can briefly orbit protons, forming muonic hydrogen, before they decay. Alternatively, if you can form an antimuon (the positively charged antimatter equivalent of a muon), then an electron can actually enter into an orbit around it. This “exotic atom” is known as muonium (with the chemical symbol Mu), and behaves a little like a lightweight equivalent of a hydrogen atom. It even has its own chemistry, being able to form short lived molecules like muonium chloride (MuCl). Theoretically, if two muonium atoms live long enough to react together, you’d create a dimuonium molecule, with the formula Mu2. But I doubt it’s ever been observed in the lab. And most particle physicists aren’t really into Pokémon. 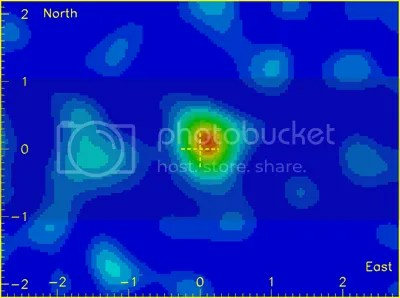 This entry was posted in Imported from Livejournal, physics and tagged astrophysics, particle physics. Bookmark the permalink.